This recipe makes approximately two dozen sweet rolls, enough to share (as my great-grandmother always did) and still hoard some in your own freezer (as I do). I have an ongoing love affair with cardamom, and sometimes slip it into these rolls in place of the more traditional nutmeg. Make the dough: Scald the milk by bringing it to just below a boil over low heat (bubbles will form around the edges, and a skin will form on top). Remove from the heat, and stir in the oil, sugar, salt, and spices. Cool to room temperature. Stir the buttermilk into the cooled mixture, and then add the eggs and vanilla extract and stir until combined. Put 2 cups flour in a large bowl, make a well, and pour in the warm water. Dissolve the yeast in the water with a pinch of sugar and let proof for 5 minutes (or until there are bubbles on the surface). Pour in the cooled milk mixture and mix until well blended. Begin stirring in the remaining flour, ½ cup at a time. When the mixture is too stiff to stir, turn it out onto a well-floured surface. Knead until the dough is smooth and no longer sticky, about 5 minutes, incorporating a little more flour as needed. Place the dough in a lightly oiled bowl (the one used for mixing earlier is fine) and cover it with plastic wrap and a towel. Let rise in a warm, draft-free place until doubled, 1 to 1½ hours. Make the fillings: While the dough is rising, make the sugar fillings. Combine all ingredients in a small bowl for each filling, and set aside. When the dough has doubled in size, punch it down and divide it in half. Roll out half the dough on a lightly floured surface into a rectangle approximately 9 by 13 inches. Brush the surface of the dough with oil, and sprinkle it with half of Filling No. 1 and then with half of Filling No. 2. Run your hand over the surface to mix and smooth the fillings. Starting at the edge nearest you, roll the dough into a log shape and firmly pinch the seam shut. Using a sharp knife, cut the dough into 12 rolls and place them in the prepared pan, nestling the rolls close together. Repeat with the remaining portion of dough and fillings. Cover the rolls with a cloth and let rise in a warm, draft-free place for 30 minutes. While the rolls are rising, preheat the oven to 375 degrees and adjust the oven rack to the middle position. 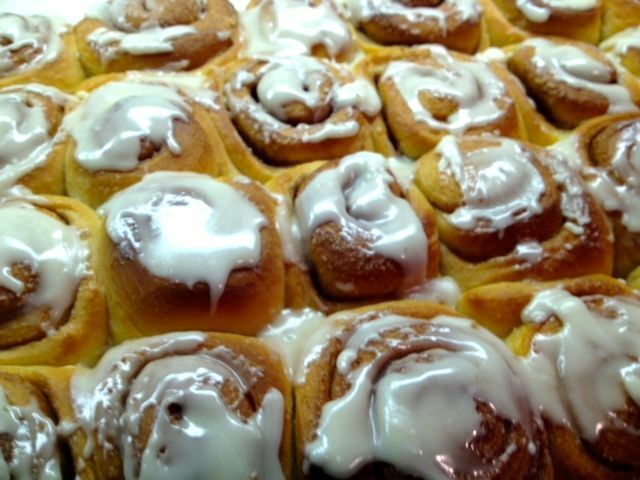 Frost the rolls: While the rolls are baking, make the frosting. Combine the liquid ingredients, then add the powdered sugar until the mixture creates a thick paste. Let the baked rolls cool for 10 minutes, then drizzle them with the frosting while they're still in the pan. Let the rolls cool in the pan for an additional 20 minutes, then lift them from the pan (using the parchment ends as a handle). Place on a cooling rack. Serve warm or at room temperature. The rolls can be divided individually or in small groups and frozen for up to three months if well-wrapped in plastic wrap and placed in a freezer-safe zip-lock bag. They reheat well in a 325-degree oven for 8 to 10 minutes, although the frosting will soak in a bit.